4-Wheel Drive Pickup For Police Dept. 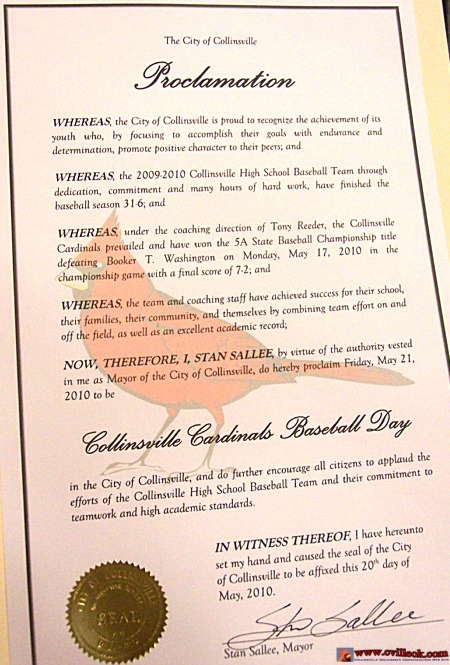 Before the May 20th meeting was called into session the CHS 5A State Baseball Championship team was recognized with a proclamation of "Cardinal Baseball Day May 21, 2010" (related coverage) & proclamation at bottom of page. MONDAY MAY 17, 2010 AT 7:00 P.M.
A. Approval of May # 1 Payroll in the amount of $37,209.29. B. Approval of Claims in the amount of $20,785.02. C. Approval of Minutes of the May 3, 2010 Regular Meeting. D. Approval of street closure for Annual Tri County Fair Parade set for August 21, 2010 from 10:00 a.m. to 11:00 p.m. on Main Street from 9th to 14th Streets. 7. Discussion, consideration and possible action concerning Bids for City Jail. -- -- approved, the base bid of Builders Unlimited ~$689K was accepted. The alternative bids were tabled for later consideration. There were 8 other bids received. Architect Jim Gabbert presented the bid options to the Commissioners. 9. Discussion, consideration and possible action concerning purchase of 2007 Chevrolet Silverado 1500 Pickup Truck in the amount of $14,800.00 for the Police Department. -- approved, after a discussion continued from the previous commission meet. Acting Police Chief Daniel Boggs indicated the vehicle would be used as a utility vehicle for a variety of uses (and specifically for icy weather) but would not be as a regular patrol vehicle. Commissioner Davis expressed cncern that the vehicle not be a "take-home" vehicle for any officer. 10. Discussion, consideration and possible action concerning Contract for Dispatching Services for Limestone Fire Protection District. -- approved, a continuation of a service already provided. 11. Discussion, consideration and possible action concerning Tulsa Area Community Intervention Center (CIC). -- approved, Collinsville became the first suburban Tulsa County community to agree to use a service already in place in Tulsa to reduce the amount of time police officers spend dealing with youths taken into custody and make available additional resources to help the youth not repeat the problem behavior. The Collinsville officers will have the option to use or not use the service based on the severity of the arrest and or availability of a parent. Existing local policy will be re-examined to consider availability of this new service. 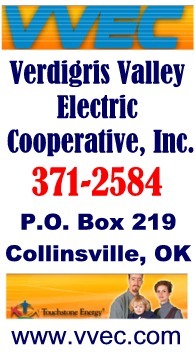 The first year of the service is at no cost to the City of Collinsville. The CIC facility is located in Tulsa and is limited to a max 24-hour stay for juveniles..
12. Discussion, consideration and possible action concerning July 4th Activities.-- approved activities on Sunday July 4th at City Park. -- City Clerk Angela McGinnis reported on planning meetings that have taken place with discussion of fireworks, vendors, band, clowns, balloons, flags, port-a-pots, hot dogs, park improvements dedication, Little Miss-Mr Firecracker, First Baptist shuttle buses, first aid booth, watermelons, etc. There will also apparently be a First Baptist celebration for Veterans earlier in the day on July 4th. * Miss Collinsville sendoff at City Hall Sunday May 23. * The new yearly city budget planning is in progress. * The Cherokee Nation has helped with $7000 (of $8200 required) for a new portable intox machine for the Collinsville Police Department. A. Approval of May # 1 Payroll in the amount of $22,375.56. B. Approval of Claims in the amount of $233,783.61. Meeting postponed to Thursday (May 20) due to CHS State Baseball game in Tulsa Monday May 17th -- Angela M.